The brutal truth behind deaths in police custody were commonly the result of torture of suspects, which is part of routine policing practice in India. The repetitive, almost mundane nature of accounts of custodial deaths reflected in our reports, and their similarity over the years, have shown the systemic and rampant nature, deep pervasiveness and centrality of custodial violence and torture in the practice of policing in Delhi. In report after report, we also saw how justice eluded the victims. We found very few cases of criminal proceedings against the accused po­lice personnel and even fewer convictions in the judiciary in cases of custodial death. 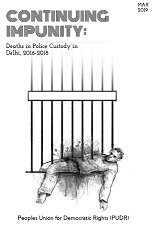 This report is the outcome of PUDR investigating of custodial deaths that occurred in Delhi in 2018 and sought to follow up the cases of such deaths that had occurred in previous years – to examine police investigations, magisterial inquiries, and court prosecutions and see if they had resulted in justice. The report also points out the non-transparent process of inquest and inquiry, no accessibility of post-mortem reports even to family members, long delays in mandatory magisterial inquiry and their access to the public and issue of compensation to family of victims.